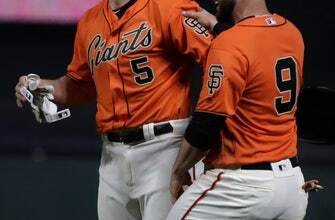 SAN FRANCISCO (AP) — Giants first baseman Brandon Belt has been scratched from Saturday’s lineup with a stiff neck, less than 12 hours after scoring the winning run in the 18th inning of San Francisco’s 3-2 win over the Colorado Rockies. Pablo Sandoval replaced Belt at first base and batted sixth. On Friday night, Sandoval doubled as a pinch-hitter and scored in the sixth inning. Belt doubled leading off the eighth against DJ Johnson and moved to third after the Rockies walked two batters to load the bases. Belt slid into home for the win against the Rockies. A replay confirmed he was safe, ending the game after 5 hours, 35 minutes. It’s the second-longest game in Oracle Park’s 20-year history. Previous article Is there really a quarterback competition at Ohio State?